100% Chardonnay Sourced from a select 27 rows within Block 1 of the cru Adrianna vineyard. Named after the gravelly ground beneath the vines, which is covered with oval white stones. 100% Malbec blended from the very best rows producing the best fruit from Four high-altitude Malbec vineyards. 90% Cabernet, 10% Cabernet Franc. A blend of the very best rows producing the best fruit, from three different high altitude Vineyards. 75% Cabernet Sauvignon, 25% Malbec: A blend of the very best rows, vines and fruit in select parcels, identified with a red sash, from three different high-altitude vineyards. 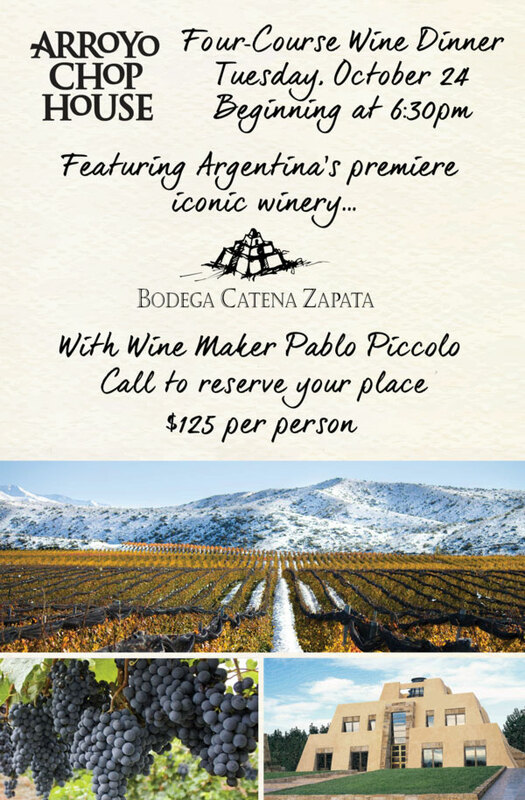 Arroyo Chophouse is extremely pleased to welcome Argentina’s premiere, iconic winery. Space is limited, call today today reserve your spot!